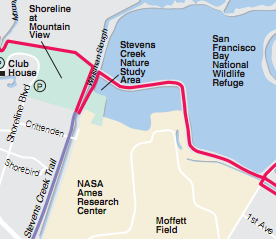 Today's walk started near the Stevens Creek Trail (shown as purple line on Bay Trail map at right), in Mountain View. 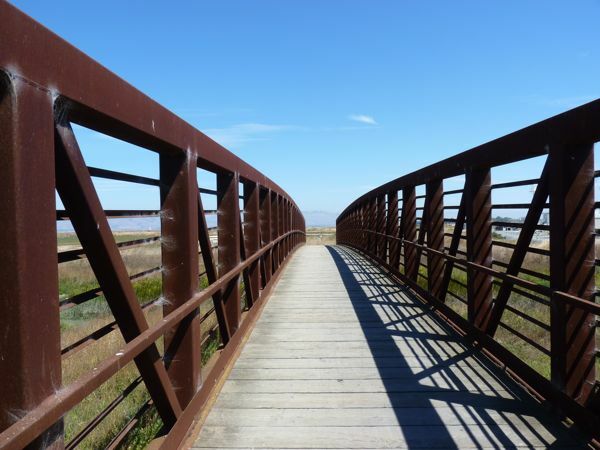 We followed the Bay Trail signs and crossed a bridge in the Whisman Slough area, and continued southeast along the San Francisco Bay to Sunnyvale, on a bay-side trail that ran behind NASA Ames Research Center and Moffett Field. 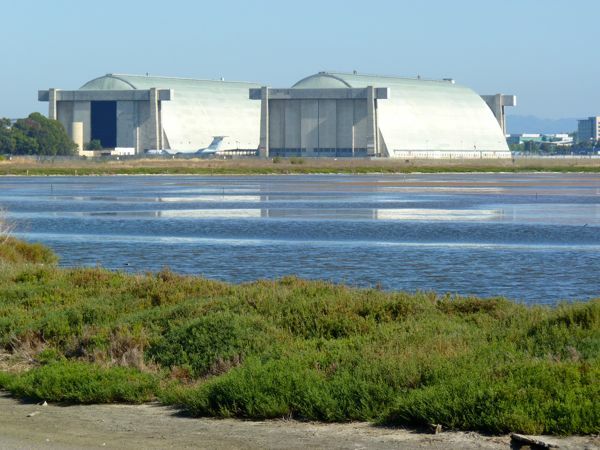 We were treated to views of massive hangars, capable of holding large blimps and planes. And, we watched a large Navy plane circle Moffett Field multiple times. 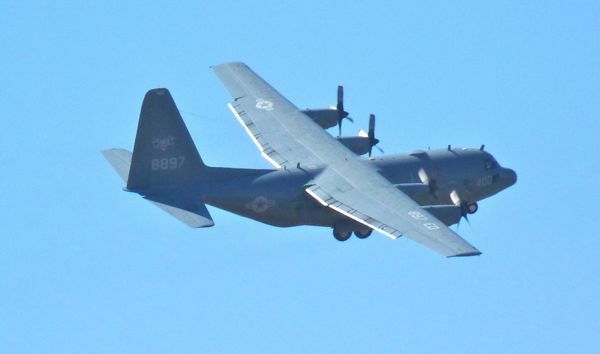 The pilot was likely logging some flight hours. 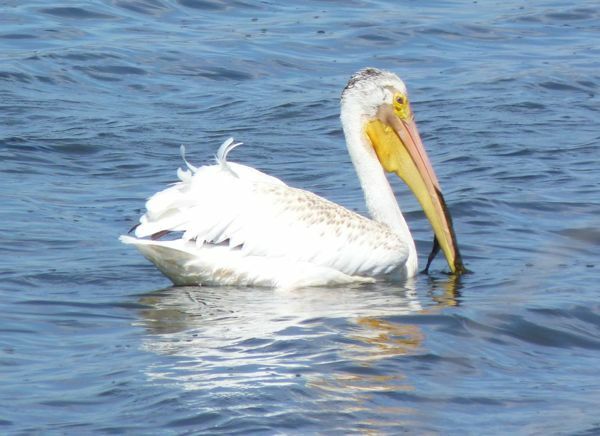 This more leisurely Saturday afternoon walk offered views of white egrets, pelicans, ducks, many other birds, and the flutterings of different types of small butterflies and moths. 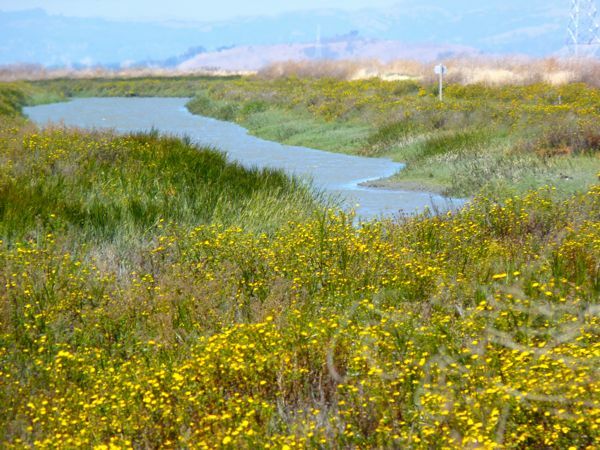 Tiny yellow flowers and patches of red (dodder) and green salt-tolerant plants hugged the dried mud and edges of the packed dirt path -- that was wide enough for bicycles to pass a walker or two. 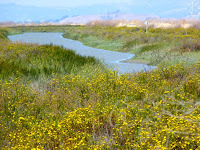 When we reached the end of the walk (the large interpretive sign with the hunter's sign in box) where I'd ended a previous walk, we turned around and watched Canada geese land on the Moffett golf course, and a small flock of goats, in a fenced area, as they did their job and munched on dry grasses, before heading back to the Shoreline Park area, in Mountain View. Thank you to Ken who accompanied me on this walk.